You can also purchase peanut butter or jelly at Little Pub. "Just ask your server to add a jar to the bill and Little Pub will take care of the rest"! Join us at Diamond Hill United Methodist Church for the blessing of the animals. Open to the community. All are welcome. * Note: All pets must be under the control of their humans. 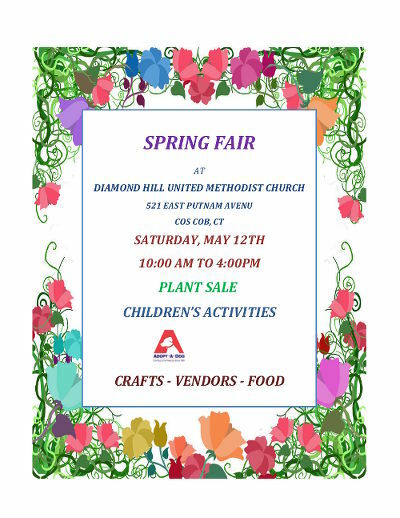 Please join us for the 2018 Spring Fair and our Mother's Day plant sale. Get your plants for Mother's Day. Children's activities, crafts, vendors, and food! We are also excited to welcome Adopt-A-Dog. A great way to spend a Saturday, and get a few gifts for Mom for Mother's Day and also have your child create a Mother's Day gift! April 1st at 10:00 a.m.
All are welcome for any/all of the services. Please visit our worship page for more information. Join us this Sunday as we celebrate Boy Scout Troop 10. Diamond Hill UMC is the charter organization for Troop 10 and our relationship with the Troop extends back almost 100 years. Please come out to show your appreciation of these young men and the adult leaders of the Troop. The Scouts will be leading most of the service. Refreshments and a time of fellowship will follow the service. The 2018 Chili Cook-Off has ended. Many thanks to those who participated in this year's Chili Cook-Off. A big THANK YOU to those local businesses who donated prizes for the contestants. Please consider visiting these businesses who support your community. Join us for the annual Cos Cob Chili Cook Off. This attracts the best chili cooks from Greenwich, CT and beyond. Come taste all of the chili and talk to our chefs. Some of the best meat, veggie, turkey, and seafood chili we have ever tasted. 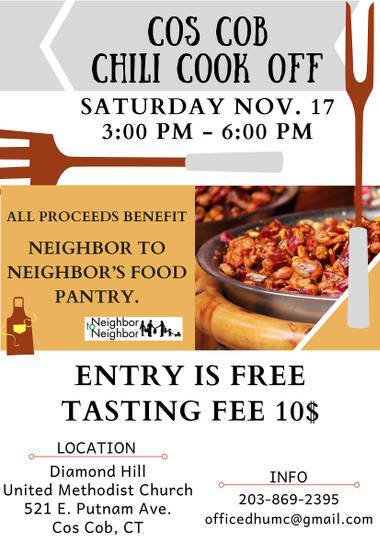 $ 10 tasting fee to benefit Neighbor to Neighbor Food Pantry. Free to enter your chili and compete with some of the best! Download the application below to enter your chili! Please fill out the form and return to Diamond Hill U.M. Church, 521 E Putnam Ave, Cos Cob, CT 06807 no later than November 9th. Available space will be determined by date on application. Note: Bob Strassel Jr. will be collecting donations for prizes from local businesses. Please contact us if you are interested in donating to the prize list. The Angel Tree will be up Nov. 19th – Dec. 17th. 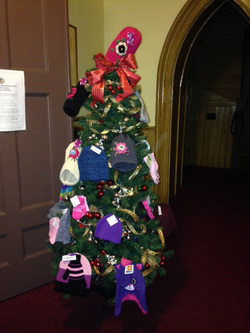 The Angel Tree is a Christmas Tree that we “decorate” with winter hats, scarves, gloves, and mittens for children and adults. The items will be delivered on Dec. 18th to Neighbor to Neighbor for distribution. ​The tree is located inside the front of the church. ​All donations to be distributed to Neighbor to Neighbor, a Greenwich, CT non-profit food pantry and community resource. Christmas Eve Candlelight Service: Sunday 12/24/2017 at 7:30 p.m.
Join us as we celebrate a traditional candlelight service of lessons and carols. ". . . for behold, I bring you good tidings of great joy which will be to all people." Our sale has ended. Many thanks to those who ordered Christmas Wreaths. Boy Scout Troop 10 is selling Christmas wreaths. 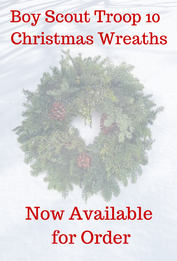 These are gorgeous, high quality wreaths. Email: officedhumc@gmail.com with your order. 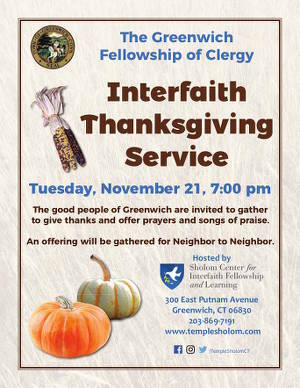 ​Join us at an interfaith service of Thanksgiving at Temple Shalom of Greenwich. All are invited to gather, give thanks, and offer prayers and songs of praise. An offering will be gathered for Neighbor to Neighbor. ​August 1 - 27, 2017 - The Drive is concluded, many thanks to everyone who donated! Donate new backpacks and school supplies to benefit children in need for the upcoming school year. We will be collecting donations to be distributed through Neighbor to Neighbor, and Boys & Girls Club of Greenwich. Bring a dish to share. Hamburgers, hot dogs and beverages provided. Picnic tables available for seating or bring your own lawn chair or blanket. Join us on the great lawn in front of the church as we celebrate the upcoming 2016 school year with a blessing of the children's backpacks. Please consider donating a backpack or school supplies to help kids in need for the 2016 school year. All donations will go to Neighbor to Neighbor and can be left at the church, or our partner in the Backpack & School Supplies Drive , Little Pub - Greenwich. We will once again be participating with other area churches in the mid-week Lenten Services. The evening begins with a simple soup and bread supper at 6:30 p.m followed by a brief (30 minutes) worship service at 7:30 p.m. The location of the service rotates among the churches and lay persons from the churches will speak at each service. Diamond Hill will be hosting on February 24th. Please check the calendar for the complete schedule. Those who have participated in the past have found these services to be meaningful and the meal to be a time of good fellowship. We hope to see you there! 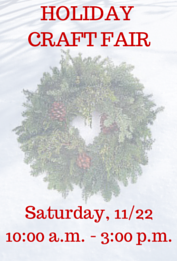 Saturday, November 21st, 2015 10 a.m - 3 p.m.
We are very excited to once again have our annual Holiday Craft Fair. The fair features all hand made crafts including: Christmas ornaments, needlework, original jewelry, paintings, and baked goods. * Luncheon Available 11:30 a.m. - 1:30 p.m. : Includes homemade soup and sandwiches. * The Boy Scouts will be selling wreaths! Please join us for a special * Healing and Spiritual Concert of Hope and Love to benefit the Greenwich YWCA Domestic Abuse Services. YWCA Staff will be on hand and there will be a song dedication for victims. Tickets are $20 at the door, and doors open at 5:45 p.m.
Join us for an exciting fall concert featuring the rock sounds of SoulShine and food from our friends at Little Pub. The concert will take place in the lower parking lot and we will have a limited menu of food available for purchase; as well as a selection of non-alcoholic beverages. 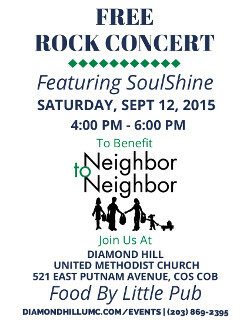 The concert is free, but we request a cash donation that goes to Neighbor to Neighbor, a local worthwhile charity. "Neighbor to Neighbor provides over 300,000 healthy meals annually. Our clients include seniors, working poor, unemployed, adults with physical, emotional or intellectual challenges, and others. Half of those we serve are children." Join us for a summer concert featuring the rock sounds of SoulShine and food from our friends at Little Pub. The concert will take place in the lower parking lot and we will have a limited menu of food available for purchase; as well as a selection of non-alcoholic beverages. Saturday, April 25th, 2015 @ 7:30 p.m.
Come join us at Diamond Hill United Methodist Church for the MasterSingers' Sizzling Hot Latin & Jazz Concert performance. featuring a theatrical multi-media live jazz,blues, Bossa Nova, and Samba music concert with The MasterSingers, salsa dancers, a Brazilian guitarist, and an acclaimed pianist! Note: Special Dress Rehearsal on Friday, April 24th, 2015 @ 7:30 p.m. The MasterSingers chorus was launched by Music Director, Pamela Kuhn in Greenwich, CT. The chorus includes performers from all over the tri-state area and features a repertoire of classical masterpieces, jazz, world music, gospel and contemporary composer showcases. 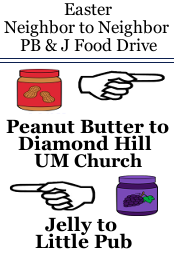 We are having a peanut butter and jelly food drive to benefit * Neighbor to Neighbor. Friday April 3, 2015 - Open for Prayer 12:00 p.m. - 3:00 p.m.
Easter Sunday Service - April 5, 2015 at 11:00 a.m.
+ Soup and Bread Supper at 6:30 p.m.
+ Service at 7:30 p.m.
Sunday, March 29, 2015 at 11 a.m.
Wednesday, December 17th, 2014 @ 7:30 p.m.
Take a break from your holiday shopping; come relax with us! Join us for carols and group singing. The MasterSingers and the Angel Choir will lead our group in song. Saturday, November 22nd, 2014 10 a.m - 3 p.m.
Sunday, November 16th, 2014 @ 5:00 p.m.
Come join us for the MasterSingers' performace of J.S Bach Cantata No. 4 "Christ Lag In Todes Banden" and Johannes Brahams "Liebelslieder Waltzes, Op. 52." The performance features pianists Dorothy Kolinsky and Justine Macurdy , member and soloists of the MasterSingers, and conductor Pamela Kuhn. Tickets to the performance are $20., but include admission to the holiday concert on December 17th. The MasterSingers chorus was been launched by Music Director, Pamela Kuhn in Greenwich, CT. The chorus includes performers from all over the tri-state area and features a repertoire of classical masterpieces, jazz, world music, gospel and contemporary composer showcases. Saturday, September 20th @ 3:00 p.m.
Come and enjoy the award-winning one-man play, The Man from Aldersgate, based on the life John Wesley, and performed by acclaimed actor, Roger Nelson. There is no charge for admission and a freewill offering will be taken. Saturday, October 4th 3:00 p.m. - 6:00 p.m.
$10 fee to taste and judge or enter.